The book addresses the care of the wolves, their history, their habits, details of how the park is run, and provides anecdotes about the wolves. It also includes stories about wolves told by visitors. Two pages have advertisements for the Kinzua Bridge. This book is not dated but I believe it was published between August 20th and September 9th, 1932. On August 20th, the Kane Republican ran an article which was repeated almost verbatim at the end of this book, but since the Kane Republican assigned definite days to the events, I believe it was the original. 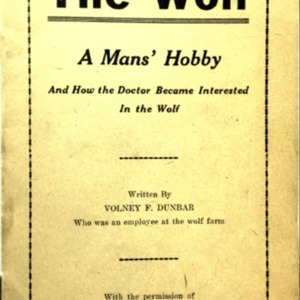 September 9th, 1932 was when the McKean County Democrat published an advertisement for the book, and the Wellsboro Gazette mentioned the book in an article on September 29th, 1932. This item was generously contributed by Carolyn S. Hedlund.